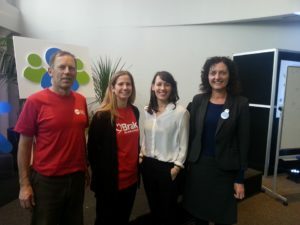 At the recent 2 Walk and Cycle conference in Auckland I collaborated on a Vision Zero workshop with Caroline Perry, Brake the road safety charity, Abby Granbery, Walk Auckland, Patrick Morgan, Cycle Action Network and Lucinda Rees, NZ School Speeds. We used our workshop Building a grassroots campaign for Vision Zero: Why we need a new approach to road safety and how we can make it happen as an opportunity launch Vision Zero NZ. I wrote about my motivation for a Vision Zero campaign in June last year . 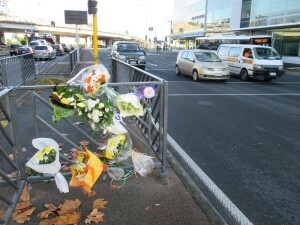 With the number of road deaths currently increasing in New Zealand, a group of organisations has come together to call on Government and local authorities to adopt a Vision Zero approach to road safety – aiming for zero road deaths and injuries. The #VisionZeroNZ campaign was launched at the 2 Walk and Cycle conference recently held in Auckland. Vision Zero is an approach used in a growing number of countries and cities around the world and at its core is the principle that life and health can never be exchanged for other benefits within society. The calls come from Brake, the road safety charity, Cycling Action Network, NZ School Speeds, Waitematā Local Board Deputy Chair Pippa Coom, and Walk Auckland, who jointly held a workshop on Vision Zero at the conference. The organisations say NZ needs to go beyond the current safe system approach by aiming for Vision Zero and creating a safe, sustainable, healthy and fair transport system for everyone. Already this year 181 people have been killed on NZ roads, a 5% increase on the same time last year and continuing a worrying trend of increases to the number of road deaths over the last two years. Vision Zero (also known as Target Zero) is a proven strategy to bring down the road toll and ultimately bring an end to road deaths and serious injuries. With the final Safer Journeys action plan now being implemented, the group say it’s time to look beyond 2020 to the future of transport in New Zealand. New Zealand has signed up to the SDGs as part of the UN’s 2030 Agenda for Sustainable Development. To achieve these goals, and ultimately achieve Vision Zero, this group is urging the government and local authorities to take action by prioritising walking, cycling and public transport, creating more traffic-free civic spaces and lowering speed limits in urban areas and outside schools to 30km/h. Organisations and individuals with an interest in Vision Zero are urged to find out more and get involved by contacting the organisations above, or going to www.facebook.com/VisionZeroforNZ. The Vision Zero approach is a commitment to aim for zero road deaths. It began in Sweden and is founded on the core principle that no loss of life on the road is acceptable, and life and health cannot be exchanged for other benefits within society. People on foot and bicycle are prioritised with low urban speed limits, traffic-free zones and safer streets and crossing points. Safety is prioritised over speed and efficiency in transport design and planning. At the United Nations Sustainable Development Summit in September 2015, all 193 UN Member States, including New Zealand, adopted the 2030 Agenda for Sustainable Development, which includes a set of 17 Sustainable Development Goals (SDGs) to end poverty, fight inequality and injustice, and tackle climate change by 2030.